April 2018 was very cold in the central and eastern U.S.; record-cold, in fact, in some places. For many of us, weather (like politics, as Tip O'Neill famously said) is local; it's easy to forget that weather conditions can vary widely (even across states or counties), and that what you're experiencing could be very different that what your neighbors are experiencing. This perspective becomes exceptionally important when discussing climate change. Source: Southeast Regional Climate Center. Click to enlarge. The map above shows how April's average temperature for cities across our region stacked up against the 30-year climate average. (To learn more about this global standard, as defined decades ago by the World Meteorological Organization, click here.) Cities marked with a "1," including Rochester, Redwood Falls, Hibbing, Mason City, and others, experienced their coldest April on record; cities with a "2," like the Twin Cities, experienced their second-coldest April on record, and so on. The map below shows how April 2018 average global temperatures compare to the 30-year climate average. While the Midwest U.S. is highlighted in dark blue (representing either very cold or record cold temperatures), the globe shows significantly more red than blue. Source: NOAA/NCEI. Click to enlarge. "The average global temperature for April 2018 was 1.49°F above the 20th-century average [...] the third highest for April in the 139-year record (1880–2018). Nine of the 10 warmest Aprils have occurred since 2005. April 2018 also marks the 42nd consecutive April and the 400th consecutive month with [global average] temperatures above the 20th-century average." Looking at land areas by region, South America and Europe led the way for heat, with each reporting their warmest April on record. 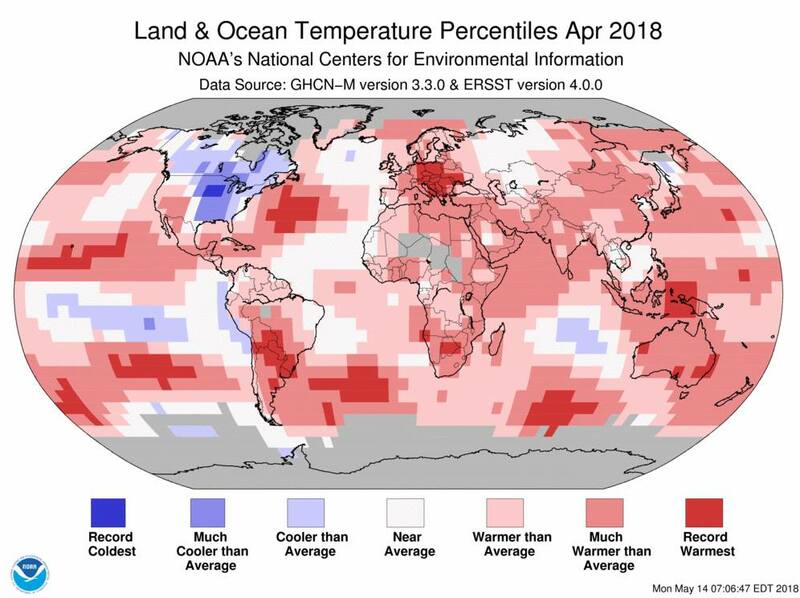 Oceania reported its second-warmest April; Africa, its fifth; Asia, its ninth; and North America, its 94th (where 2018 tied with 1918 as 15th coldest). "...average global temperature was 1.37°F above the 20th-century average of 54.8°F. This was the fifth warmest average temperature for the year to date on record and the coolest such period since 2014. The years 2015, 2016 and 2017 ranked among the three warmest year to date periods on record." More notable climate facts and stats are available by reading the entire April 2018 NOAA/NCEI report.